I remember being a Pokémon lad back in the late ‘90s, when various anime started to become more popular among the younger generation. When it was released in 1999, Digimon was seen as the rival to the Pokémon franchise, and they sure had similarities, but many things set them apart, and I also remember that creating a Nintendo vs SEGA style rift in the school playground between Pokemon and Digimon tragics. 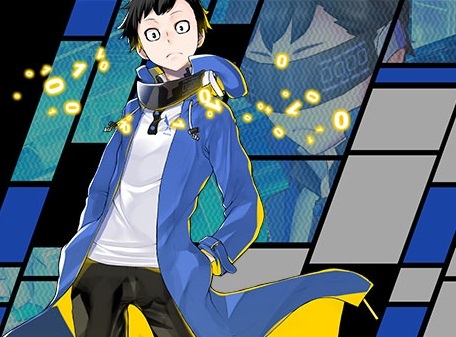 Related reading: The Cyber Sleuth games have surprisingly deep stories. 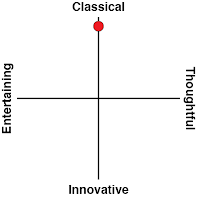 Here's an in-depth look at some of this game's predecessor's themes. I haven’t followed the world of Digimon closely in the past ten years, in fact it wasn’t until the first Cyber Sleuth game was released that I realised it was still an active franchise. That game proved to be a hit for Namco Bandai, as it was actually a (perhaps) surprisingly well-created game made for the fans. This sequel, titled Hacker’s Memory, promised to be more of the same as the original, but better. The first difference touted in this release is the number of Digimon that is able to be captured, rising from 249 to 340 in total. The fact that the number is nowhere near the sheer ridiculousness of the number of Pokémon people need to nab to catch 'em all, was actually quite a relief. Another saving grace is the simplistic nature of the type system contained in Digimon. There are only four types in the game: Data, Vaccine and Virus make up a rock-paper-scissors style dominance system, while the No Relation type has no advantage or disadvantage over the other three. There is also a system in place where you can see if an opponent is strong or weak against you while you target them in battle, which is handy. For the most part, battling is easy and intuitive, without any need to source an elaborate encyclopaedia to know what needs to be done in battle, and I quite enjoyed my time battling. One thing that took some getting used to as it’s much different than how Pokémon works, is the act of evolving, or “digivolving” and devolving the monsters. This occurs in the Digi Bank, because obviously everything needs to start with Digi in this game. The Digi Bank acts as a tool for managing everything in the Digimon word, such as altering the party and accessing the Digifarm, which allows you to start some side quests and train the Digimon themselves. 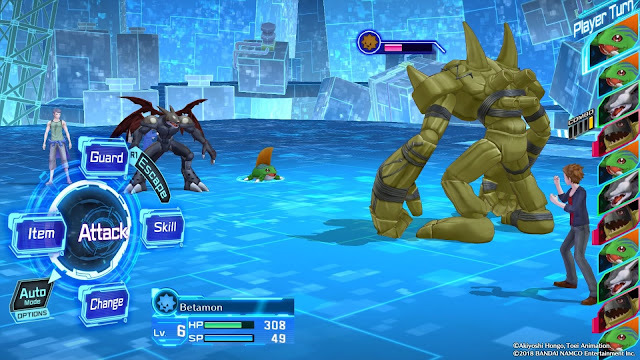 The Digifarm is a great way to build partnerships with Digimon, even when they are not a part of your main party. You can also evolve, or “digivolve” your Digimon and also Devolve them, which is necessary for building stats over time. For the narrative of the game, arguably the most important part, it follows the escapades of high school student Keisuke. His identity has been stolen and Keisuke becomes accused of a crime he did not commit. He seeks out answers and bumps into the group of hackers known as “Hudie” (they wear hoodies, get it?). 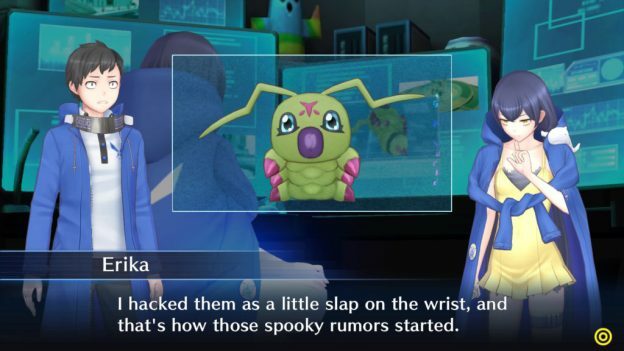 He soon befriends a Digimon that is considered “scrap” by its seller, and it soon becomes apparent that despite these creatures being computer programs, Keisuke proves he has a heart and is able to befriend the Digimon in a way that others never have. It is an interesting look into AI and how us as humans treat them. Can AI get to the point where it can have real feelings? Will humans get to the point where we can have feelings over AI? These are surprisingly deep, pressing questions I found myself asking as I played through the game, it was quite potent in its question on human morality. Even if it wasn’t the main focus of the game throughout, it was the most gripping part of the narrative. The game itself also acts as a standalone story to the first game, much like the Darksiders series, this sequel actually takes place at the same time as the first game, so there are moments where Keisuke meets characters from the original game, offering a new perspective of these characters. This way of storytelling allows the actions that certain characters do to have a better context, allowing the player to better understand the motivations of characters. Too often in games we see characters doing certain things purely so they serve a purpose to the protagonist, to explore the same era from different perspectives isn’t done often enough, and always feels fresh every time it is utilised. It does really require a play through of the original game in order to get the full experience. The side quests for the most part are pretty well done. Most of them are rather humorous, and aid the player in discovering a lighter side to Keisuke. One of these side quests involved Keisuke’s quest to find a girlfriend, another has Keisuke seeking advice on black cats as one had crossed an NPC and they believed that the cat had cursed them. There are a lot of goofy memories to be had with the side quests in this game. I do have one major gripe with Hacker’s Memory, navigating the overworld is an absolute garbage fire. Moving the character is fine for the most part but the maps are small and unhelpful. The map doesn’t even have an objective marker so most of the time Keisuke is just running around aimlessly trying to find the next person to speak to in order to progress the story. 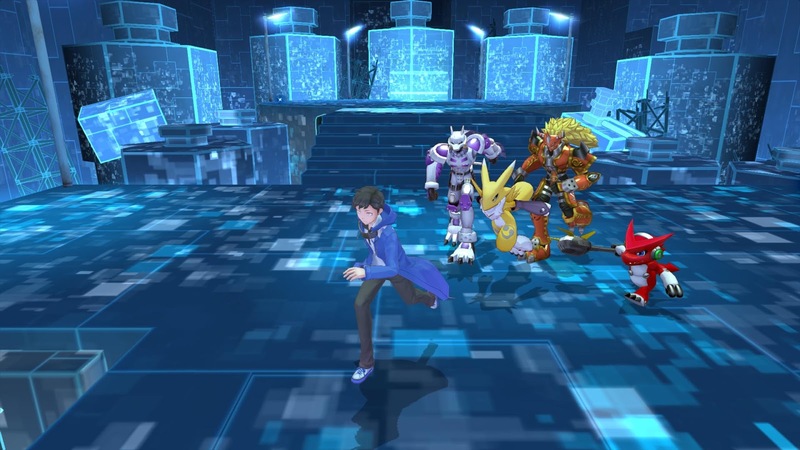 Digimon Story: Cyber Sleuth – Hacker’s Memory continues the recent trend of great Digimon games. The battling is very accessible, meaning that the fantastic story can be accessed by anyone. The collecting enthusiast in me also looks forward to continuing to fill up my Digidex, because nothing ever looks good unless completed. 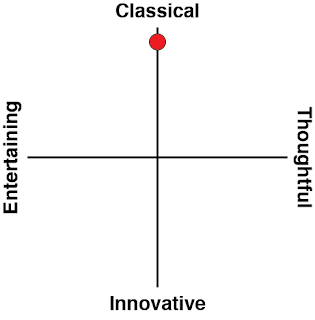 There are aspects of the game that are really annoying, but I don’t think that they ultimately get in the way of what is a really good game. If you enjoyed either Digimon or Pokémon way back 18 years ago, there’s a lot to discover in this game, particularly if the more child-friendly shows have become a turn off over the years.